By Sue Chan - New Zealand - 04 Aug/03 - Viewed 5400 times. Travelling north from Dunedin our smoko stop was at Palmerston in a park near a creek, after which we continued on to Moeraki where large boulders are scattered along the beach. 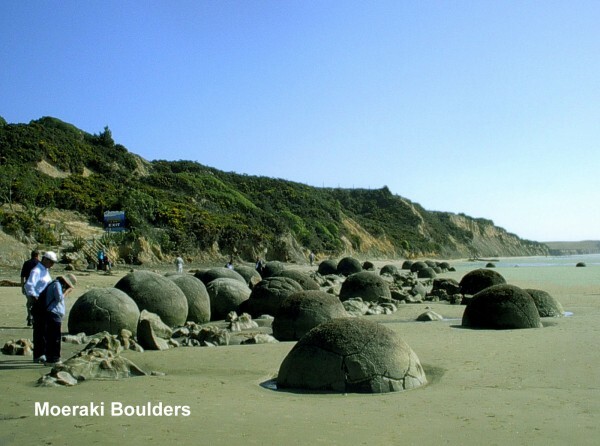 These concretions have formed over millions of years around a central limestone crystal core and have been washed out from the cliffs. We could see another embedded in the cliff above ready to fall some time in the future. The boulders are gradually worn away by the action of the waves and eventually split open. Two of them were found to contain dinosaur bones. Thirty Kilometres further north is Totara Estate where, in 1882, sheep carcasses were processed before being sent south by rail for the first refrigerated shipment from N.Z. to England on the clipper �Dunedin�. The Historic Places Trust has restored the 1860s limestone farm buildings. Reaching Omaru at 12.15pm we found our way to McDonalds � where there is always parking, toilets and food! Omaru, gateway to Mackenzie Country, was founded in 1858. �The white stone city� boasts the best-preserved collection of commercial buildings in the country with more than 20 in the main street, Thames Street. The local limestone from which the buildings are built comes from a quarry on the outskirts of the town. This limestone became a valuable commodity when it was discovered that it could be sawn after it was quarried and it hardens when exposed to air. Thames Street was made exceptionally wide to allow turning space for bullock teams hauling drays laden with wool to the docks. We walked the length of this street looking at the buildings, which date from the 1860s and admiring the central gardens. After lunch we drove along Harbour Street where there are many more buildings from the same era � most in need of restoration - when Omaru was a busy port exporting produce from the rich farms of North Otago. We now headed inland on SH83 hoping to eventually reach Mt Cook. A short distance past Duntroon, named by an early run-holder after his hometown in Scotland, there is an interesting rock shelter. Discovered at Takiroa in 1852 this shelter was used 500 years ago by Maori family groups while searching the area for moa and other food sources. Here they recorded the things they had seen on their journey. After centuries of exposure to the open air the drawings have faded considerably and an American rock art enthusiast removed some in 1916! However those that remain make interesting viewing and conservation measures are being undertaken. At Kurow the Vicarage of St Albans and the Chapel was built from Omaru limestone in 1892 and has a kauri interior. The Vicarage was unoccupied and there was no one in the small town to give us any further information. The dam at Lake Waitaki was completed in1934 during the depression after six years of hard work. This was the last hydro-electric dam in New Zealand to be built using pick and shovel earth-moving methods. The workers and their families lived in temporary housing and there was a school for the children. Further on the concrete Aviemore Dam was completed in 1968. A feature of this dam is the kilometre long fish-spawning race, which allows trout to migrate upstream from Lake Waitaki to spawning grounds close to the dam in Lake Aviemore. Now a holiday village on the shores of Lake Aviemore, Otematata was originally built to provide accommodation during the Aviemore and Benmore power projects. We detoured 5km into the Benmore Dam, where the trees were beginning to display their autumn colours. This solid earth dam is 110m high and 488m wide at the base. It contains 12 million cubic metres of material and is New Zealand�s largest dam of any type. Work began in 1958 with the first generators commissioned in 1965. At the Visitor�s Centre Ron had a long conversation with the attendant about various dams and learnt there are eight power stations in the Waitaki Power Scheme from Lake Tekapo to Lake Waitaki. Benmore Power Station was originally designed with two generators to supply the South Island, but four more were added later for the station to supplement the North Island�s power over the inter-island link, now popularly known as the Cook Strait Cable. Benmore is now the second largest hydro-electric power station in New Zealand, (the largest is Manapouri). The largest power station overall is the geothermal station at Huntly on the Waikato River in the North Island. After a very interesting day we arrived at Omarama, where our accommodation for the night was at Country Time Resort Hotel about two minutes from the small village. This proved to have been a good choice and after a look around the village we had a nice fish dinner in the dinning room � what else in an area known for it�s fishing. The next day dawned bright and clear, the perfect day for driving through mountains. Armed with a brochure from the information shop in town we set out to Paritea, 10km west, to see the Clay Cliffs. The rocks actually consist of layers of gravel and silt rather than clay and are situated on private property across lowland tussock country. The Clay Cliffs are an example of �badland� erosion. A combination of steep, sharp, bare pinnacles and ridges separated by deep narrow ravines, this kind of landform develops on certain types of rocks in arid or semi-arid regions subjected to occasional heavy rainstorms. �Badland� was originally used to describe part of a region that was difficult to cross, the most well known being in South Dakota U.S.A. and is now widely used to describe this type of landscape. Originally part of Benmore Station running 100,000 sheep, the property was subdivided in 1916. Fifteen blocks were turned into Returned Soldier Settlements, some as small as 180 hectares. The scheme was disastrous both for the land and the new owners, most of whom were forced to move off within a few years. The Clay Cliffs block was sold in 1919 to Mr W.E. Aubrey, grandfather of the present owner. The Aubrey family, in order to ensure that the remarkable landscape is preserved initiated a National Trust open space covenant to protect the Clay Cliffs in perpetuity. The Clay Cliffs are reached through farm land with several closed gates, at the first of which is an ice-cream container with the lid taped on into which one puts the $5 entrance fee. The container was full so obviously had not been emptied for some time. Everyone must be very honest here. It was well worth the detour to see the cliffs. Returning to SH8 we continued north to Kelland Ponds at the end of Lake Ohau. Storms frequently whip up the lake creating large waves but on this clear, still day the reflections were attracting a lot of tourists. Lake Ohau marks the boundary between Canterbury and Otago, so we were about to leave Otago and return to Canterbury where our journey would soon end. We passed through Twizel where the major activity is fishing. This small town was built in the 1970s to house workers building the hydro electricity scheme. The 70,000-hectare Aoraki Mount Cook National Park is listed as a World Heritage Area. We were thrilled by our first view of Mount Cook, Australasia�s highest (3754 metres), from Peter�s Lookout near Lake Pukaki. We continued on around the lakeshore stopping many more times on the way to look at the views before arriving at Mt. Cook Village at 10.30 am. We found a building, maintained by National Parks, with large tables and hot water and sink provided where we had smoko. There were glass windows on three sides with mountain views. This would be a popular place in the winter sitting in the warm and looking out at the snow. We drove 7km along unsealed Ball Hut Road to the car park at the start of the track to the Blue Lakes and Tasman Glacier Lookout. This 28km glacier is the longest in the southern hemisphere. The track began predictably enough climbing steadily to the Blue Lakes but from there on it was a hard climb over large boulders to the viewpoint across the Glacier, which was some distance away. There was not much to see at this time of the year with only a little snow on Mount Tasman. The valley floor, 70m below the lookout, is covered in rock transported by the Glacier. The ice below this rock is 200m thick and even deeper further up the valley. We returned along the shore of beautiful Lake Pukaki, fed by the melting waters of the Glacier, which tint the water aqua blue, to the end of the lake where we turned east onto the SH8 and stopped at Pukaki Lookout. Here there is a large parking area (full of tourist busses) and a Visitor�s Centre with tables overlooking the lake where we had our lunch. Lake Pukaki was raised 37 metres when the Pukaki High Dam was completed in 1976, doubling the lake�s storage capacity. Our next stop was at Lake Tekapo, another lake that gets its colour from the fine particles of powdered rock held in suspension in these glacial meltwaters. The air here is reputed to be the clearest in the Southern Hemisphere. After visiting the shopping centre we continued on to the Church of the Good Shepherd, which was built of stone and oak in 1935 to honour the pioneer families of the area. Built on a small hill overlooking the lake this is one of the most photographed churches in the country. Nearby is a statue of a collie dog erected in 1968 as a tribute to the sheepdogs that helped develop Mackenzie Country. Commissioned in 1951 Lake Tekapo Power Station is one of the eight in the Waitaki Hydro Scheme and can be seen across the lake. From here the water from Lake Tekapo travels along a canal to Lake Benmore. Water from Lake Pukaki and Lake Ohau is also channelled into the Scheme at Benmore. Lake Tekapo�s central location protects it from rough coastal weather and it enjoys some of New Zealand�s highest sunshine hours. A short distance along the road we came to Dog Kennel Corner � remembered only because of the name- where a group of hikers were boarding a bus. From here we travelled over Burkes Pass and soon discovered how the weather could change nearer the coast. There was no rain but it became cloudy and quite cold. Continuing along SH8 we travelled through Peace Avenue, a row of oak trees planted as a war memorial, on the outskirts of Fairlie. There are also rows of trees along the main street, which were planted by early settlers. In a few weeks there would be glorious autumn colours. At the Information Centre we asked for a map of Timaru where we would be spending the night. The lady was very helpful and asked if there was anything else she could do. We said we were a bit worried about finding our way again in Christchurch and with the help of a colleague she worked out a back way for us to travel to get to our accommodation near the airport. We had a nice afternoon tea at the bakery caf� then continued on to Timaru where we arrived at Mountain View B&B at 5.30pm. After a drink and chat to the hosts we drove back into the town to get our bearings and something to eat. It was quite dark now with no daylight saving and very quiet so we only looked around the main shopping street before returning to Mountain View. Our fellow guests were a party of four German travellers who spoke almost no English, which made breakfast the next morning quite interesting! As we had only about 200km to travel that day we were in no hurry to leave and helped with the English lesson. The morning was misty with no views of the mountains from which the guesthouse takes its name. We were told the mist would clear later in the day but that through the summer the mountains had been covered in smoke from the Canberra bushfires. (We have since heard that there was ash on the glaciers from the same fires). We had a little trouble with circles and one-way streets in Timaru but eventually came to Aigantighe (pronounced egg and tie) Art Gallery in an historic house just out from the centre of town. Established in 1956 it is now one of the largest Art Galleries in the South Island with works by many famous artists and is one of the town�s show places. Here in the garden amongst the falling oak leaves is a permanent exhibition of Omaru stone sculptures done by artists from N.Z. Japan and Africa and given to the city following a competition in 2000. Armed with a map from the man at the desk, we were able to find parking below Bay Hill at the Caroline Bay show ground where Gypsy Caravans were getting ready for a weekend fair. We passed through the Trevor Griffiths Rose Garden on our way up the steps of the newly built piazza to the top of Bay Hill where historic buildings have been converted into shops and restaurants. We continued down the hill to the main shopping area, had coffee and walked around back streets where we saw several churches before returning to the piazza. By now the mist was clearing and more Gypsy Caravans had arrived. Retracing yesterdays route we returned to Pleasant Point and the Railway Museum where steam trains run over a 3km line. Ron wanted to see the world�s only Ford Model T Railcar and although it wasn�t operating that Friday morning we found several volunteers working on building a new siding who told us we could go into the shed and look around. Heading north we came to Geraldine, a small country town with an Irish place name, where we had read there was a Giant Jersey. This was officially recognised by the Guinness Book of Records in 1999 and measures 16ft from wrist to wrist, is 7ft high, has a chest measurement of 120inches and weighs 5.5kg. It is housed in a shop where handcrafted knitwear is made. In another room of the shop is a replica of the Bayeux Tapestry Mosaic depicting the Norman Conquest of 1066. It is made on panels 12 inches high and the overall length is 111 feet. The mosaic is made from one and a half million tiny pieces of spring steel, each 1/96th inch in area and painted with enamel paint. Geraldine is a nice town on the Inland Scenic Route and it was quite warm as we walked around the shops and visited a church in the square before finding a place for lunch. Returning to SH1 we continued on through Tinwald where there is a Pioneer Village and Railway Museum with restored traction engines. Further along the road we met several old traction engines being driven slowly along obviously for a weekend exhibition. After a short stop at Rakaia we arrived at Fleur Lodge B&B in the Christchurch suburb of Avonhead at 3.30pm. We had no trouble finding it with the help of the directions from the lady at Fairley but without them I don�t think we would have done very well. The Hostess was very friendly, gave us afternoon tea and talked for two hours! Later we went to the nearby shopping centre and bought Chinese take-away, which we ate at the kitchen bar. We spent the evening re-packing the cases ready for our return home the next day and did well to get everything back into them. At 8.45 the next morning we left to drive the 20mins to the Christchurch Airport. We did not have to go through any city so it was very easy and after leaving the car in the Hertz Car Park we checked in our luggage only a few minutes before passengers from two bus tours arrived. We paid the departure tax, changed our money, filled in the customs forms, took the keys to Hertz and were finished by 10am so thought we did well. This left us plenty of time for morning tea and a look around the shops. We bought placemats which we later collected after we had passed through customs. Our flight left at 11.45 about 15mins late and we had a rough trip. For a while we didn�t think the attendants would be able to serve drinks. We arrived in Brisbane at 1.30pm Australian time (N.Z. 3.30pm) and as we had a five and half hour wait for the flight to Rockhampton we took our time getting through immigration and customs. We left the luggage at the Qantas forwarding desk and took the train to the Domestic Terminal where we sat and watched the planes coming and going for about two hours. A bit different from our rushed changeover when we set off! There is not much to do or see at Brisbane Airport but we walked to the far end and had a drink then went to our departure gate. About 5pm all the storm-warning lights around the tarmac and on each corner of the building started flashing and dark clouds rolled in. Just what we would need to be held up by a storm! We boarded at 6.45pm and although the trip was a bit rough and there was lightning around we arrived on time at Rockhampton at 8.05. We were met by Sam and Mavis Vaughan and grandson Matthew and arrived home just after 9pm after a very enjoyable four-week trip to New Zealand.